Innovative and brand new, our solid laminate worksurfaces offer a 12.5mm ultra-slim design which can be shaped on-site thanks to its solid coloured core and ease of cut. With a double-sided decorative surface incorporating fabulous designs and textures that you have come to expect from Bushboard, Evolve is even more hard wearing than a traditional laminate kitchen surface as well as being 100% waterproof. With Bushboard evolve luxury ranges you are assured stand-out style. The finest materials and manufacturing techniques guarantee products of superior quality, with edges expertly finished to the highest standards. material on the end of a furniture run or island unit will give your kitchen a distinctive contemporary feel. Featured; Bushboard Evolve Marmo Calacatta 12.5mm ultra-slim worksurface and upstand in ultramatt texture. 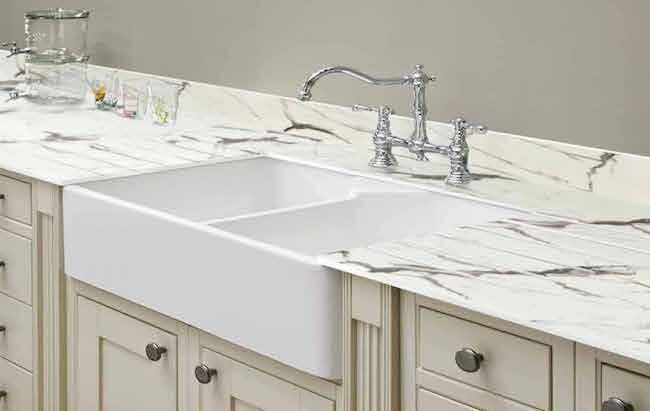 Image shows Belfast sink and drainer grooves with exposed white core.